Boys enjoy wearing stylish and cool clothes. If you want your kid to be dressed according to the latest trends in fashion, you are welcome to look through the collections of Stella McCartney Kids, Kenzo, Molo, Ikks, Fendi and other world-famous designer trademarks that provide the best outfits that you would ever find on the fashion market. Check out the collection of MSGM first and you will find a lovely combination of colors and shapes. A summer costume that comprises of a long-sleeved shirt and loose shorts will diversify the wardrobe of your kid and make him look cool on hot summer days. It is presented in a combination of beige, white and black colors embodied in a striped design that looks extremely stylish and trendy. The outfit can be combined with fashionable sunglasses to complete the impression. Kenzo provides multi-colored T-shirts with bright and trendy patterns and prints. Such T-shirts go well with white summer caps that are light and comfortable to wear. Stella McCartney Kids provides a nice option for a rainy day in the form of a stylish overcoat available in black color and added with a lovely print. A cozy hood will keep wind and rain away and make your child feel comfortable even in a nasty weather. Molo offers trendy grey trousers that are intended not only for sports activities, but also for wearing on a daily basis. As for the footwear, you might opt choosing stylish black shoes by Fendi with yellow outer soles. Ikks provides a variety of T-shirts for wearing during hot summer days. 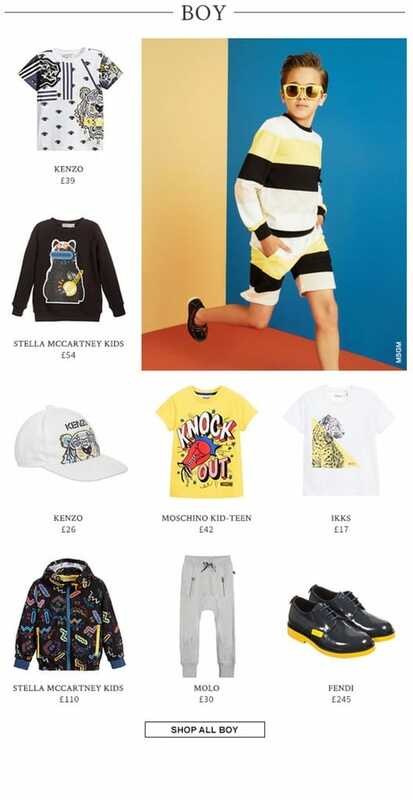 Moschino Kid-Teen also offers a variety of light summer T-shirts but these are available in brighter variations of colors and are added with colorful prints. Choose the most suitable option without hesitation and your kid will be fully equipped for entertaining outdoor activities. All young boys love fashion and want to wear only stylish and trendy clothes day after day. We are happy to present you the recent collections of such brands as Moschino Kid-Teen, Ikks, Molo, Fendi, Kenzo and many other designers that offer a great range of shapes and colors embodied in a variety of clothes, accessories and footwear for casual wear and special events. Ikks provides a whole range of fabulously designed T-shirts, while Fendi offers stylish footwear available in black and yellow color combination that makes it look trendy and fashionable. Moschino Kid-Teen provides an assortment of light amusingly designed T-shirts featuring lovely prints and available in different colors. Molo provides fashionable grey sports trousers for casual wear. An overcoat by Stella McCartney Kids will be a good option for a rainy summer day. It will keep your child from windy and nasty weather and provide maximum comfort and coziness. Check out the collection of MSGM as well. It is filled with a variety of casual wear intended for wearing on a daily basis. A trendy black, beige and white costume will be a nice addition to your kid’s wardrobe. The costume features multi-colored stripes and is represented by fashionable shorts and a long-sleeved shirt. Such an outfit is the best option for wearing on a sunny day. The outfit can be added with sunglasses that will protect your child’s eyes from burning sunlight. Kenzo also offers a range of lovely accessories including a trendy white cap to be worn in hot weather. All the above designers have much to offer to young customers and you will be delighted to learn that the prices are quite affordable for such trendy outfits. Don’t hesitate to choose some of the best-looking and best-fitting clothes for your little fashionista. You will be absolutely delighted with the quality of every piece of clothing!